Back to the house of horrors for Miami. The RedHawks were shut out in their personal torture chamber, Amsoil Arena, 4-0 vs. No. 11 Minnesota-Duluth on Friday night. It was the second straight game in which Miami failed to light the lamp, bringing their scoreless streak to 152:01. MU was also blanked by St. Cloud State in its series finale vs. St. Cloud State last Saturday. The loss drops the RedHawks (10-16-3) a season-worst six games under .500, as they are guaranteed their third straight losing regular season. Miami slipped to 0-9-1 in its last 10 games in Duluth. RECAP: A pair of quick goals midway through the first period was all Minnesota-Duluth would need. Mikey Anderson got the Bulldogs (15-13-3) on the board at the 8:19 mark and exactly two minutes later, Billy Exell extended their lead to two. Jade Miller and Louie Roehl added markers in the second and third periods to seal it. STATS: Miami was outshot, 13-4 in the first period and 29-11 through the opening 40 minutes. — Gordie Green and Carson Meyer fired three shots each. Josh Melnick and Louie Belpedio blocked three shots apiece. — The RedHawks slipped to 1-13-1 in their last 15 games in February and beyond. THOUGHTS: It was Jan. 5 when Miami beat Denver to improve to 9-8-2, and at that point an NCAA at-large berth seemed like a legitimate possibility. The six weeks since have been a dumpster fire, with the RedHawks going 1-8-1 and pretty much eliminating themselves from NCAA Tournament consideration by any means other than an NCHC Tournament win. The RedHawks were beaten soundly in that finale vs. the Pioneers, which was not surprising considering they’re one of the best teams in Division I.
Miami had winnable road games vs. UNO and Colorado College, but its defense was a no-show for those series. MU went 0-3-1 and allowed 25 goals in those games. The RedHawks won their first game back on home ice, 4-2 vs. Western Michigan but dropped the next three in Oxford, one to WMU and a pair to St. Cloud State. Now the offense is AWOL, as Miami was shut out for the final 92:01 of its series vs. the Huskies. Add 60 to that after failing to score in this contest. The difference between that SCSU shutout and this one is the RedHawks actually played well for most of their game against the Huskies. They laid an egg on Friday – a goose egg. LINEUP CHANGES: It was the same 18 skaters for Miami, but Ryan Larkin was back in net after sitting the Saturday game vs. St. Cloud State due to an illness. Chase Munroe was between the pipes for that contest. 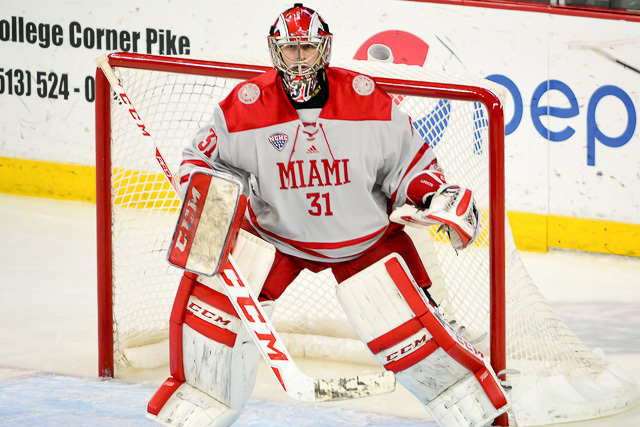 FINAL THOUGHTS: With Miami destined for a road series to open the NCHC Tournament, it’s becoming a distinct possibility the RedHawks finish the regular season at Denver and return there the following weekend a la 2015-16 vs. Duluth. MU’s chances of having a lucrative postseason get longer with every February loss. Posted on February 17, 2018, in 2017-18, Uncategorized and tagged 2017-18 miami redhawks, Minnesota-Duluth Bulldogs, NCHC, ryan larkin. Bookmark the permalink. Leave a comment.